How to get there: The dirt road going west from the small town of Alma (17 miles south of Keystone along highway 9) to Kite Lake is a good starting point. Route description: The climb is an easy walk when the conditions are nice as we experienced it. Comments: Having just arrived back in the US, this was my first trip with Pål Jørgen, age 11. 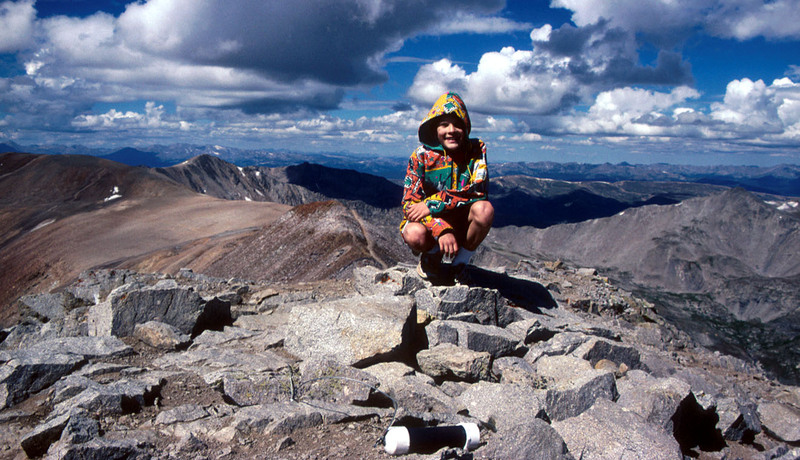 We climbed Lincoln as the second 14.000 feet mountain that day, Mt. Bross being the third. En route, we also passed over Mount Cameron (4340 m), a named peak, however, more like a hump on the way to Mount Lincoln than a separate peak, its vertical rise from the saddle with Mount Lincoln is less than 50 meters. The entire trip from the car and back took us 4 hours, it should be stressed that the conditions were close to ideal. The summit of Mount Lincoln, the view is towards Mount Cameron.